Background: Discovery of novel antiviral agents is essential because viral infection continues to threaten human life globally. Various heterocyclic small molecules have been developed as antiviral agents. The 5,6-dimethoxyindan-1-on nucleus is of considerable interest as this ring is the key constituent in a range of bioactive compounds, both naturally occurring and synthetic, and often of considerable complexity. Objective: The main purpose of this research was to discover and develop small molecule heterocycles as broad-spectrum of antiviral agents. Method: A focused small set of 5,6-dimethoxyindan-1-one analogs (6-8) along with a thiopene derivative (9) was screened for selected viruses (Vaccinia virus - VACA, Human papillomavirus - HPV, Zika virus – ZIKV, Dengue virus - DENV, Measles virus - MV, Poliovirus 3 - PV, Rift Valley fever virus - RVFV, Tacaribe virus - TCRV, Venezuelan equine encephalitis virus - VEEV, Herpes simplex virus 1 -HSV-1 and Human cytomegalovirus - HCMV) using the National Institute of Allergy and Infectious Diseases (NIAID)’s Division of Microbiology and Infectious Diseases (DMID) antiviral screening program. Results: These molecules demonstrated moderate to excellent antiviral activity towards variety of viruses. The 5,6-dimethoxyindan-1-one analog (7) demonstrated high efficacy towards vaccinia virus (EC50: <0.05 µM) and was nearly 232 times more potent than the standard drug Cidofovir (EC50: 11.59 µM) in primary assay whereas it demonstrated moderate activity (EC50: >30.00 µM) in secondary plaque reduction assay. 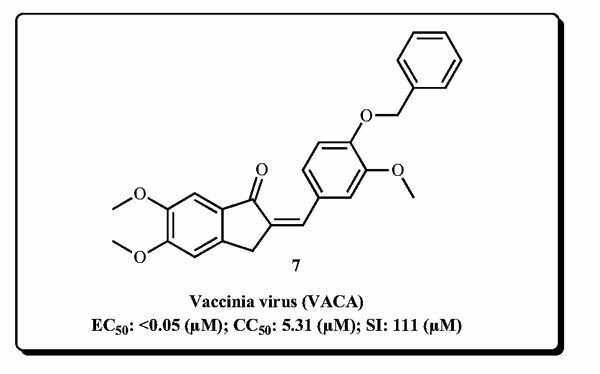 The thiophene analog (9) has shown very good viral inhibition towards several viruses such as Human papillomavirus, Measles virus, Rift Valley fever virus, Tacaribe virus and Herpes simplex virus 1. Conclusion: Our research identified a novel 5,6-dimethoxyindan-1-one analog (compound 7), as a potent antiviral agent for vaccinia virus, and heterocyclic chalcone analog (compound 9) as a broad spectrum antiviral agent. 5, 6-Dimethoxyindan-1-one, virus, antiviral, in vitro screening, NIAID, ketone, HIV.